There's something special about Somerset. I grew up in this diverse county - living on the Quantock Hills maybe it was inevitable that I have been fortunate enough to spend my spare time watching and photographing the local wildlife. It's not just about 'Quantock', within a stone's throw is Exmoor National Park, The Mendips, The Blackdowns, The Somerset Levels and the West Somerset Coast. All of these provide a photographer's paradise. My photography all started in the early 1990's. However the spark had been ignited years before this. Walks on the hills and family holidays to Scotland where we always looked for deer, Golden Eagles, Otters and other wildlife. As I took to the hills on my own I looked for and tracked our local wild Red Deer. Starting with various different film cameras and mid-zoom lenses I soon leaned my field craft. Without the benefit of the big lenses I quickly learned how to get close to the deer to achieve something respectable, this has been a good learning tool. It then all lead onto understanding exposure, shutter speed and light ... which I'm sure I'm still learning and toying with now. With the advances in camera technology came the digital revolution, but there was something special about film images that I liked, or maybe I just didn't want to embrace change! I decided to take the plunge with the Canon 20D in the early 2000's and this opened a new world. Photography became more 'open' and you could review images as quickly as you could take them. Despite all these 'photographic' changes I have never ventured far from my local Red Deer. There's something magical about deer, maybe it's the pre-historic hunting instinct or maybe the enjoyment of watching our largest wild land mammal seemingly 'appear and disappear' as you try and follow them through woodland or across a hillside. Each encounter teaches you new things, whether about the wildlife itself or photographically. My biggest reward so far was winning the members category of the British Deer Society's photographic competition in 2006. Photographing deer presents many other photographic opportunities. Deer can be found through a wide range of habitats and parts of our landscape. The landscape itself often presents early morning images with the sunrise across the hills or through the trees; woodland and moorland images; birds or other mammals; and hill ponies such as the endearing Exmoor Pony. My wildlife photography is though just a hobby. I tried to make it a profession but just couldn't sell enough prints and gift cards. Although I still produce prints and cards it's just to fuel my hobby. 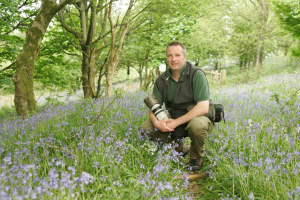 I'm also director of Wood-Land Southwest ltd - a countryside management and grounds maintenance company. Planting new woodlands and running a contracting team to manage our wild landscapes keeps me in touch with wildlife 'hot spots' so I can return on an off day to try and photograph what I've seen. "While deer can be shy and elusive, wild flowers present equally challenging situations and very different shutter speeds. With Britain's diversity of such wildlife I've been lucky enough to experience many unforgettable encounters with common, shy, elusive and rare wildlife in their natural environment."